Retirees shouldn't avoid stocks - rather, they should load up on high-quality companies like these two. After you retire, your investing focus should shift away from growth and toward income and capital preservation. This can mean getting rid of some of your more-volatile stocks, and buying some others that can produce solid performance while still allowing you to sleep at night. One good place to look for ideas is in the portfolio of the greatest long-term investor of all time, Warren Buffett. Here are two great examples of Buffett's favorite stocks that retirees may want to consider for their portfolios. There are a few characteristics that good retirement stocks tend to possess. Keep in mind that the stocks in your portfolio don't necessarily have to have all of these, but the more the better. A history of consistent profitability and revenue growth. A dividend that increases every year. Shareholder-friendly management (managers who own large stakes themselves and prioritize return of capital to shareholders). A manageable debt load -- In other words, the interest on the company's debt represents a small fraction of its income. A wide economic moat. In my opinion, this is the only non-negotiable characteristic that all retirement stocks must have. This refers to a durable competitive advantage that prevents peers from taking market share, and will allow the company to thrive for decades to come. The entire energy sector has plunged lately -- or has it? One stock that Warren Buffett has been aggressively buying is Phillips 66 (NYSE:PSX), which not only has handily outperformed other oil stocks since prices crashed, but is actually up despite the persistent low prices. One reason for this is the diversity of the company's business. Phillips 66 has operations in the refining and marketing, chemicals, and midstream portions of the oil industry. And many of the company's operations actually perform better when oil prices drop. 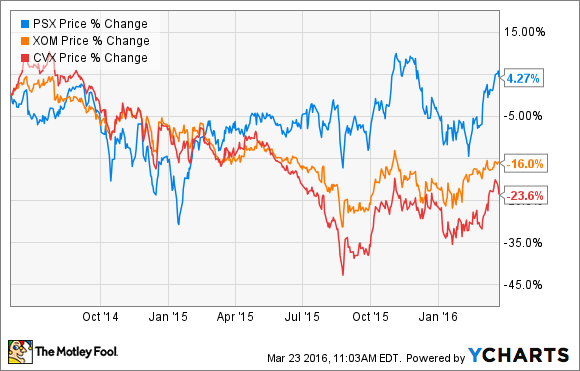 Unlike the other stock mentioned here, Phillips 66 isn't a predictable dividend machine. The stock yields 2.5% now, but the quarterly dividend has grown rapidly during the past few years. However, return of capital to shareholders is a big priority for management. Sure, the dividend is a work in progress, but management has spent $6 billion on buybacks since 2013. I'm confident that management will remain shareholder friendly, and I'd have to assume Warren Buffett feels the same way -- after all, Berkshire Hathaway (NYSE:BRK-A) (NYSE:BRK-B) owns a 14.3% stake in the company, including several large investments during the past year. As far as predictable dividends go, it doesn't get much better than Coca-Cola (NYSE:KO), a longtime Buffett favorite that currently pays a 3.1% yield. The company has paid dividends every year since 1920, and has increased its payout for 53 consecutive years. Many people have a negative outlook on Coca-Cola because of declining demand for sugary drinks like its flagship product. While this is certainly a valid concern, investors should be aware that its namesake beverage and other high-sugar products are just one of Coca-Cola's many product offerings. The company currently has 20 separate brands with more than $1 billion in annual revenue each, and its ventures into water, tea, and juice beverages have helped revenue to continue to grow despite changing consumer tastes. Speaking of brand names, Coca-Cola's is one of the most valuable in the world, which gives the company pricing power over rivals -- this is why you pay more for Coca-Cola than a generic brand. Adding to this competitive advantage is one of the most impressive and efficient distribution networks of any company in the world, as well as lots of cash to use for marketing, advertising, and R&D. The bottom line is that Coca-Cola is a safe bet for retirees who want income and growth, without too much downside risk. It's a common misconception that retirees should get out of stocks completely, and instead keep their money in fixed-income investments like bonds and CDs. While these definitely have a place in retirees' portfolios, nothing could be further from the truth. High-quality dividend stocks like these should make up the majority of older investors' portfolios, even after retirement. The problem with fixed-income instruments -- other than the fact that interest rates are historically low right now -- is that they'll do nothing to help you keep up with inflation. After all, $1.00 when you retire at 65 will not have the same value when you're 85. For this reason, it's extremely important to create a growing income stream, and the best way to do that is with rock-solid stocks like the ones I mentioned here.